Why do you assume this member doesn't have the appropriate permits? The question was about plants, not permits. I covered several NZ topics, Hilde, just in case. That gives this person more options to find the answers they are looking for. Now this member has ample resources to be successful with these geckos. If this person already knew, the additional links open other members' eyes to these awesome New Zealand live-bearing geckos. Last edited by Elizabeth Freer; 11-26-2018 at 03:15 PM. I do know about permits because a registered permit holder is supplying the geckos to me, and unless the law changed you only have to get a permit if you are going to breed or pass them on. However I will be applying for a permit as they are likely to breed, but i will get the enclosure built and ready first. But yes my query was mostly about what is the best coprosma for the enclosure habitiat along with driftwood etc. These geckos are awesome! You're lucky to live in New Zealand. Sure how do you send a PM, or how do i accept your PM? I haven't quite sent that PM. Are you set up for all notifications on your GU profile? I did a search on Coprosmas and didn't find much, only about what artificial plants were good, my question is about what coprosma is best for green and forest geckos, of course along with driftwood etc. I sent you that PM. I would have answered that question if I knew. I've never been fortunate enough to keep these geckos. The answer is "out there", I'm positive. 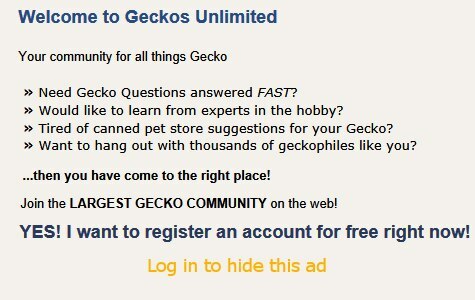 Geckos Unlimited was much more active back in the day, prior to the influx of FB groups. I'm grateful this thread is open -- that it has not been closed.